As the world of marketing continues to evolve, agencies and businesses have been attempting to develop new ways to attract leads and promote their brands. For many, implementing a video marketing strategy has been a very profitable solution to differentiation -- and the numbers show they're right. Video has the ability to illustrate a brand’s story, personality, product, or even a mission faster than words alone. Rather than worrying about your users hitting three pages that help explain all that, users can sit down and capture all that data in a more memorable, quick format with video. What's even more critical about video as a marketing tool is how easily it can be shared across social media. In fact, many platforms, including Facebook, are favoring video content more than ever before. 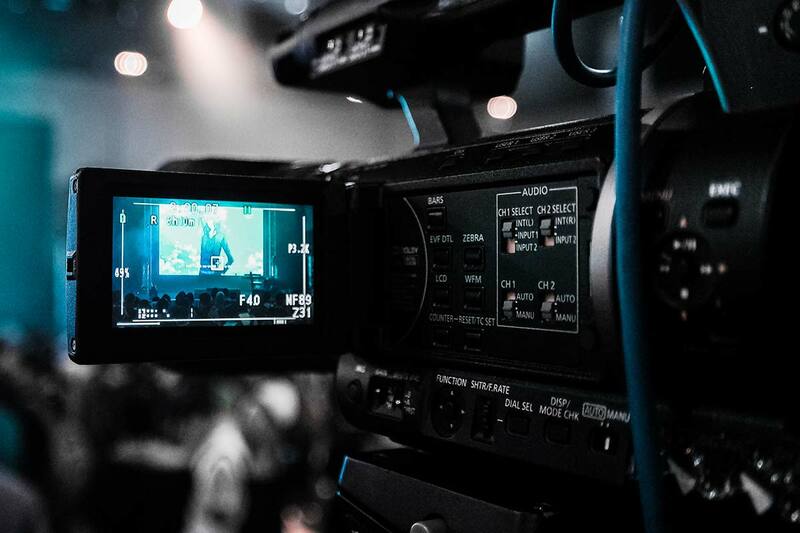 If you aren’t sure if creating a video marketing strategy is the best fit for your brand or inbound marketing campaign, try checking out these statistics to help convince yourself why video marketing is vital to your brand’s growth. Data doesn't guarantee that something will work for your audience. As our friend and partner, Marcus Sheridan recently expressed on Facebook, data is often skewed and representative of the limited sample size used to conduct the research. While this information is interesting and can provide insight into trends, at the end of the day, the only way to know if something is worth your investment (whether it be video, paid ads, social media, etc.) is by testing! Use these video marketing stats to guide your strategy early on; not as the expectation! According to MarketingCharts, the most important personal driver for users when sharing content (either self-created or external, in this case) is the desire to connect with people, share knowledge, or bring awareness to an issue. This is most commonly done through video that is funny or entertaining. With this in mind, when creating a video promoting your brand that you want high share counts on, make sure it's "light." This usually means it's meant to attract users who are in the awareness stage of the buyer's journey, rather than consideration or decision making, where information gets more product focused. Users will have a much more enjoyable time watching a video intended for those in the awareness phase and understanding its message, rather than one whose sole purpose is to convert users. As the video is shared, those who find the message resonates with them are the ones who will continue to investigate your company more, and your website can do the rest to help convert them. Lack of video on your website could be a huge mistake in explaining to your users an aspect of your company that may help push them towards converting. One example I love is Wistia’s video promoting their new video player, Vulcan. Rather than someone sitting and explaining exactly what their video does, they chose to illustrate the player’s importance in a more creative fashion that also illustrates why the product is necessary. Once the video’s over, users are left not only understanding how videos video player as improved and outperforms older players, but with a little giggle too! Video comes in handy to show certain interactive product's full potential. Users like proof that a product not only works but looks the way they expect. They want to know that using it will be easy for them to navigate and understand and video helps achieve that better than a static image. Products such as the Amazon Echo, whose vocal functionality is the interaction you have with it, benefit greatly from a video of it in use. This way users can get a sense for it in an everyday environment before deciding if it’s something that integrates into their own life. This statistic is incredibly important for those of us who do most of our business over the phone, especially if the one calling is a company decision maker. In this situation, video can help be the deciding factor between purchasing or passing on a product. The video doesn't even have to be something super dry and heavy. For example, try hosting a light webinar that explains what your product does, or, make a short video animation that advertises its benefits. Make sure you keep your mind open when storyboarding your idea! At this point, you already know that mobile users have begun outperforming their desktop counterparts, and those numbers won’t be reversing anytime soon. For these users, it’s imperative that the video is able to overcome any opticals that mobile may present. For example, when embedding your video, make your video itself is responsive, otherwise, it may be impossible for mobile users to view. If you choose to have a CTA at the end of the video, be wise to those viewing it on a smaller device. It may end up being more challenging for them to complete the action, for example, asking them to go to a URL with a non-responsive webpage. Mistakes like this can end up costing a portion if qualified lead conversions. Due to the size of most mobile screens, make sure the video isn’t trying to focus on anything too small and difficult to see for those on smaller screens. You want users to be able to watch and understand it regardless of the device they view it on. One of the biggest pushbacks businesses has when deciding whether or not video marketing is the right solution for them is what the ROI of it is and how it’s measured. Rather than just using views as a metric to prove ROI, you can also integrate analytics from heat maps, average watch duration, and re-watch rate. Segmenting out what users are rewatching the videos can signify customer interest and allow you target them for campaigns to continue working them down the sales funnel. Wistia can help you track the popularity of your videos and their performance and what sections of the video people are rewatching the most. From there, you can see which users are watching it the most, and begin targeting them with content or emails that continue to resonate with them. With so much content, there are that many more videos you're competing against to outrank. This means video optimization and tactics to generate traffic to your channel are more important than ever. Users tend to enjoy videos that aren't selling a specific product or service. This is because our brains actually don’t like overt selling, they prefer videos that evoke more emotion and don't show any obvious bias. This does not mean that any old video will automatically increase your conversions. What you create needs to actually evoke emotions by either addressing a pain point while revealing an attainable solution. Your video marketing strategy cannot be salesy or self-centered. Mobile users have been shown to gravitate towards longer-form content more than likely due to how attached we are to our devices these days. As I've already mentioned, you can't assume mobile users won't be watching your content. You need to present videos to them that are easily watchable and desirable for audiences on mobile devices. We all know that users prefer to skim website content rather than read it in-depth, but if you invite them in with visual content that's enticing, unique, and creative, then they will take the time to give it a watch to see whether or not it meets their needs. People love video content, and they love seeing video marketing strategies that help answer questions, address pain points, and show how-to's or tutorials. But until more marketers figure out ways to quickly produce videos, then those who currently dominate in the space will continue to crush those not adopting video marketing. 80% of global internet traffic. How could marketers not begin integrating video marketing into their marketing strategy in any way, shape, or form? If we aren't producing video's by 2019, then you're already behind the curve, losing out on global internet traffic that very well may have your audience in it. From a personal standpoint, I know I do this all the time. When people are at home relaxing on their sofa or bed and online shopping, many of those people are already on their phones and tablets. It only makes sense for them to feel a little more compelled to take the time to watch these videos on these devices, rather than at a desk (where they are probably at work anyways). When you see a video that you've particularly enjoyed (whether it's a tutorial on doing your taxes or a video of cute kittens playing), chances are you remember, and also share or mention that video to those around it. Creating videos that have effects like that are the perfect storm and can drastically help generate awareness for your video content. Although users prefer to engage in longer form content nowadays, that doesn't mean every video you make needs to be 10+ minutes. Keep it short and concise. Two minutes should be all you need for most of your video marketing content. Videos can be a great way to produce content that helps showcase products, and outline tutorials. If the videos you make can save users the time of jumping on the phone, or, act as a source to better understand services they are interested in, then they will watch them. A poor quality video can be all you need to tarnish your brand's reputation. When creating video content, don't cut corners just to save money, you may find your company losing money in the long run. Whether it's through conversions, traffic, or brand awareness, video content has the potential to positively impact SMBs in a variety of ways. If you don't know where to start, take a look at what people are doing on Facebook Live, you'd be surprised at the video marketing strategies companies are using. Earn your customers form-fill with this free eBook on 10 out-of-the-box inbound marketing ideas!